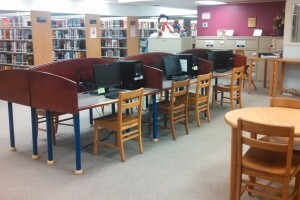 When you stop by the library, you will see new tables for the computers! The tables were generously donated by Fremont Public Library due to their remodeling. They arrived Monday, January 4, 2016. Since we have new tables, we are also beginning to rearrange the central section of the library. We created more reading and study spaces, set up laptop stations, and shifted tables for group collaboration.